These fresh cocktails are anything but garden-variety. Blame it on the perennially popular Bloody Mary or the juice-cleanse craze: Vegetable cocktails have been sprouting up everywhere we look. Not only are they a perfect complement to spring weather, but they also let us pretend that happy hour is healthy (mixing carrot juice into your drink totally cancels out the alcohol, right?). Below, find recipes for three of our favorite vegetal sips of the moment. Paul Vitale of Sweet Paul uses clean-tasting celery as a base for a vodka drink. “The combo of lime, cilantro, and celery is fresh and fruity with an unexpected herbal note, plus the color is amazeballs,” he tells PEOPLE. If you like your drinks rich and bold, try the El Comediante cocktail from Brandon Matzek of Kitchen Konfidence. Matzek first infuses golden rum with bell peppers before mixing it with wine, ginger syrup and mint. “The red wine floating on top pairs beautifully with the red bell pepper rum. And with each sip, you’ll get a noseful of spicy fresh mint,” he writes. And if you wouldn’t dream of sitting down to brunch without a mimosa, whip up this vividly colored variation from Karen Troughton of Kitchen Treaty. The simple twist: It’s made with carrot juice instead of orange juice. 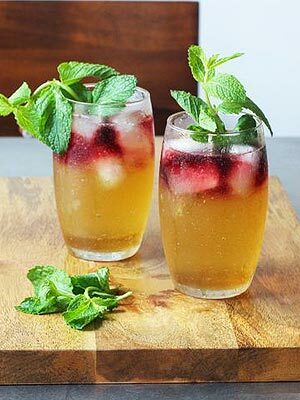 Troughton writes that she tried the recipe first with ginger syrup as a sweetener, but found that the combo of carrot juice and a dry sparkling wine tasted the best. We couldn’t figure out how she’d gotten the carrot tops to balance so perfectly in the drink until we spotted her handy tip: “Snip a plastic straw to about two inches in length, slip two or three stems inside, and set in the champagne glass,” she writes. So stop saving your veggies just for salads and garnishes: These produce-packed libations are anything but garden-variety. 1. 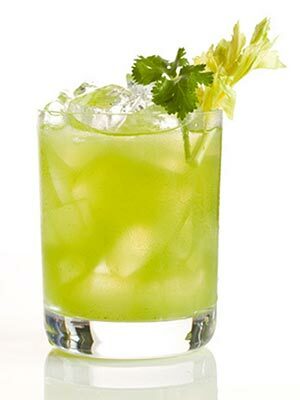 In a mixing glass, muddle celery and cilantro together. 2. Add the vodka, lime juice and simple syrup. Add ice and shake well. 3. Push contents through a fine mesh strainer into a glass filled with ice. 4. Garnish with celery greens and cilantro. 1. Combine rum, ginger syrup and lime juice in a short glass with ice. Stir until well combined and chilled. 2. Add ginger ale until almost topped off. Gently pour red wine on top, adding just enough so it pools in a layer on top (be careful not to pour in too much). 3. Garnish with the sprig of mint. 1. Remove the stem, seeds and ribs from red bell peppers and discard. Slice bell peppers into long, thin strips. 2. 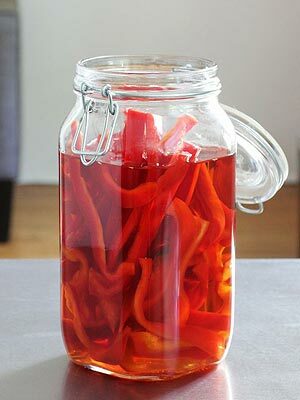 Place sliced peppers in a large, airtight container and pour in the rum. Seal the lid and store in a cool, dark spot for 24 hours. 3. Strain infused rum through a medium mesh basket strainer into a clean bottle or container. Discard solids. Store in the refrigerator. 1. 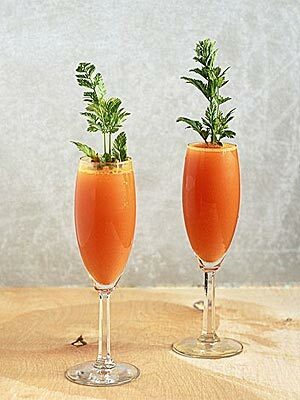 Add carrot juice and sparkling wine to a champagne glass. 2. Garnish with carrot stems or parsley sprigs and serve immediately. Note: Start with a ratio of slightly less carrot juice to sparkling wine and adjust the amount of carrot juice to suit your preferences. This article originally appeared on PEOPLE Great Ideas.